« So, what would get you marching in the streets? 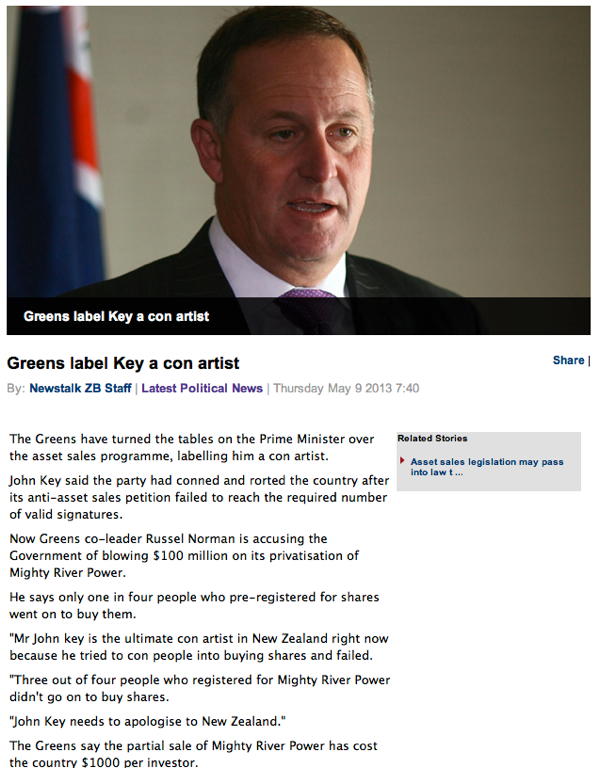 Trying to pin a ‘con artist’ tag on Teflon John Key. Yeah, good luck with that. I heard the NZ Prime Minister John Key (right) waxing lyrical about the (according to him) ‘rort’ that was the Opposition’s Stop Asset Sales petition. If I hadn’t known better I’d have said Mr Key was a glass or two off being refused wine service himself. His response seemed a politically desperate overreaction to news that about a quarter of the 393,000 signatures on the petition were found to be illegible or duplicates or unqualified for some other reason, leaving the petition 16,500 signatures short of what’s required to trigger a referendum, and that the petition organisers had two months to gather them. As I listened to Mr Key’s spin on the topic to reporters at Parliament on Radio NZ’s Morning Report yesterday, I noticed how LOADED TO THE GUNWALES his [Crosby-Textor-scripted?] performance was: It was dripping with invective and allegations of dishonesty and ill-motivation against the Greens and Labour, using words like ‘rort’, ‘bogus’, ‘mislead’, ‘rip-off’, ‘fake’, ‘false’, and notably, twice: ‘con the NZ public’. “The lady doth protest too much, methinks,” I muttered, unoriginally. Have a listen for yourself below. A professional politician (for that’s what Barbecue John has become) surely must be aware of glass house rules. By any reasonable standards it’s ‘Brain fade’ Key who is seen as a ‘con artist’ by a number of his political opponents and other observers, given his many false attempts to be up-front about the GCSB and the Kim Dotcom affair (see Matthew Hooton on John Key’s GCSB ‘recall problems’ and repeated failures to ‘come clean’), not to mention his transparently slippery non-explanations for keeping fellow amnesiac John Banks in his job. Green Party co-leader Russel Norman is one of Mr Key’s harshest critics. It seems to me his disrespect for the National Party leader is sincere and performance-based (arising from Mr Key’s performance, I mean). Clearly pissed off by Mr Key’s extraordinary allegations that the Stop Asset Sales petition was knowingly/deliberately presented with non-conforming signatures — and Mr Key’s dishonourable and (probably) unparliamentary smear that his political opponents are somehow less sincere and honest than his own National Party cabal, viz; “Labour and the Greens’ modus operandi is that they haven’t really cared about the rules” and “They actually tried to mislead the NZ public” — Russel Norman wasted no time in responding. Based on a press release from the Green Party co-leader here: Mighty River con revealed. Coming on the heels of Steven Joyce’s recent loss of composure/hissy fit alleging ‘economic sabotage’ in response to the Labour-Greens joint electricity policy statement (see: Steven Joyce’s hyperbolic response to an Opposition policy announcement) one can’t help but think the one-seat majority National-led coalition government is getting spooked. 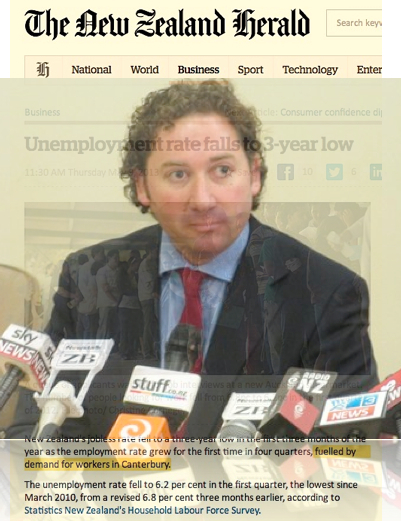 Mr Key’s overreaction reminded me of his scare-mongering prior to the last election. 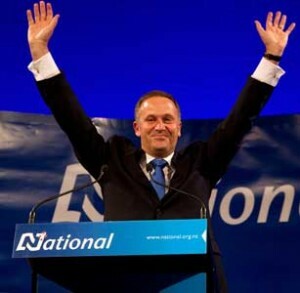 Remember when he was warning us all that a vote for NZ First and Winston Peters was a vote for ‘unstable government’ and ‘another election in a few months’? Yet now he’s cosying up to Winston Peters in an effort to cling to power. 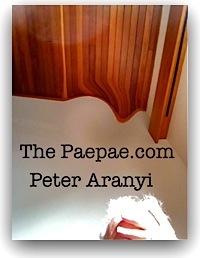 Peters, in my experience, remembers past slights … and he will extract a price for his support. If you’re lucky, Mr Key. At last a bit of good news for the beleaguered National government. But overshadowed by the National caucus’s self-confessed dickhead. Key’s response may have been off, err, key but Russel’s reponse was sillier. A lot of people would have pre-registered with the intention that they would keep their options open to buy shares, and at the last moment, recieved an unexpectedly high power bill that left them short of cash on the day. Or decided that the Labour/Green announcements scared the sh*t out of them and they decided to not risk investing after all. Either way, Russel’s muscle in the tussle is mostly hustle and bustle. Actually, far from being ‘sillier’ it seems to me Russel Norman’s deliberate echoing of John Key’s transparently exaggerated political attack lines (‘rorted the system’, ‘conned the public’, ‘should apologise’) was, in part, designed to be satirical. Indeed, I think the last Labour government got to that point too. Before it lost.